A leaking roof left un-fixed will lead to serious damage. Signs of leaks include water entry in the roof, damp insulation and even stains or mould. Severe roof damage as a result of storms can be reduced if roof repairs and maintenance are carried out before they get too bad. 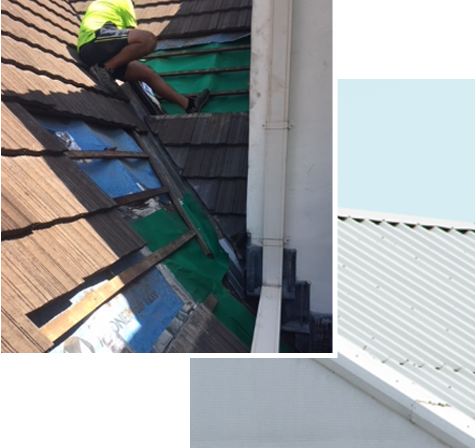 KWR Roofing are the experts in roof repairs in the Gold Coast & Brisbane. Trust us to take care of your roofing jobs, whether you’re looking for roof leak repairs, replace valleys, full re-bedding of ridge caps or storm damage roof repairs. We’ve got you covered for the lot. We specialise in locating and fixing leaks in your roof. Our experts can identify any roof leak you may have, including general wear and tear, broken tiles or ridge capping and seepage through flashings to roofs that have blown off.